Over 400 first responders lost their lives on September 11, 2001. Heroically performing their sworn duty, these firefighters, members of the NYPD and PAPD, and numerous other rescue workers will forever be remembered for their sacrifice. One of the most difficult times in Ronnie E. Gies's life came two years ago, when his family's home in Merrick, on Long Island, burned down. 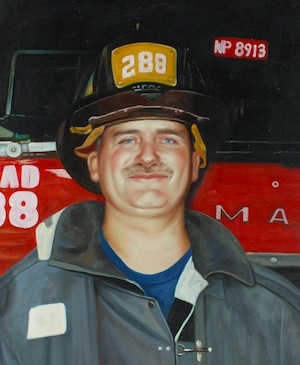 It was not so much the destruction that upset Firefighter Gies, 43, of Squad 288 in Maspeth, Queens, but the fact that he was suddenly the recipient of favors and good will from neighbors, instead of being the benefactor. "It was very difficult for him to be receiving and not giving," said his wife, Carol. "Someone would call at 3 in the morning because their toilet was clogged, and Ronnie was there." Luckily, Firefighter Gies was also a carpenter. With a little help, in six months he built the family a new home, with a basement big enough to serve as hang-out headquarters for his sons, Thomas, 18; Ronnie, 16; and Robert, 14; and their friends. A couple of years ago, Firefighter Gies took the lieutenant's test, after studying for hours at the dining room table. Recently, Mrs. Gies was told her husband had been pegged for a promotion on Sept. 10. "It meant a lot to him to be promoted," Mrs. Gies said. "He never knew." Profile published in THE NEW YORK TIMES on December 30, 2001.
owned exclusively by Hero Portraits, Inc.
All images, portraits, stories,and personal information contained herein, and the 9/11 Memorial design (or likeness thereof) are copyrighted and cannot be used or reproduced in any form, without the express written consent of Hero Portraits, Inc. Violators will be prosecuted to the fullest extent of the law.